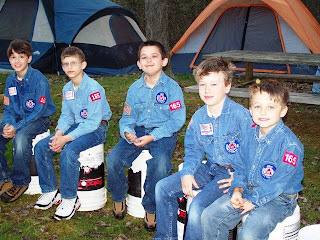 Ohio units of Grace Brethren Boys, a ministry of men mentoring boys, held their Spring Outpost over the weekend at Atwood Lake Park with Millersburg Unit 152 hosting the event. There were 76 boys and 44 men at the Outpost. Saturday started with a service project. The boys picked up trash and flood debris from several parts of the park, including the dam and launch areas. After lunch at their campsites, they participated in afternoon events, with groups of rotating through basketball/volleyball, kickball, ultimate Frisbee, and a two mile nature hike. Gary Nussbaum, of Transport for Christ, a ministry for truck drivers, spoke on Saturday evening and Sunday morning. The 2008 Honor Unit Award went to Unit 20, Trinity – Northwood. In the photo above, are members of Unit 165, which meets weekly at the Homerville (Ohio) Grace Brethren Church. For more information and photos, click here.